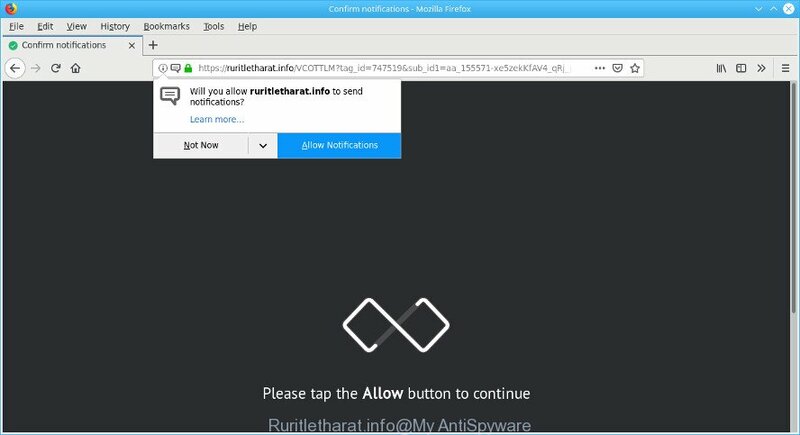 If your browser gets redirected to unwanted web site called Ruritletharat.info or a lot of advertisements are displayed where they should not be then it could mean that you have an ‘ad-supported’ software (also known as adware) installed on your PC system. Adware is a group of malware that created to display undesired commercials on the infected machine. In this blog post we will discuss what ad supported software is and how can you get rid of Ruritletharat.info pop-up advertisements from the Mozilla Firefox, Chrome, Microsoft Internet Explorer and MS Edge manually or with free adware removal tools compatible with MS Windows 10 (8, 7 and XP). It’s not a good idea to have an unwanted application like the ad supported software which causes annoying Ruritletharat.info popup ads. The reason for this is simple, it doing things you do not know about. And of course you completely don’t know what will happen when you click anything in the Ruritletharat.info pop-ups. The worst is, it can collect your browsing history and personal data, including passwords and credit card numbers. In the future, confidential info can be transferred to third parties. So, obviously, you need to remove the adware immediately. Use the free tutorial below. This guide will help you clean your computer of ad supported software and thus get rid of the Ruritletharat.info intrusive pop ups. In most cases adware requires more than a simple uninstall through the use of Windows Control panel in order to be fully removed. For that reason, our team created several removal methods that we’ve combined in a detailed instructions. Therefore, if you have the intrusive Ruritletharat.info redirect on your computer and are currently trying to have it uninstalled then feel free to follow the few simple steps below in order to resolve your problem. Certain of the steps will require you to reboot your machine or shut down this page. So, read this guide carefully, then bookmark or print it for later reference. The useful removal guide for the Ruritletharat.info pop up advertisements. The detailed procedure can be followed by anyone as it really does take you step-by-step. If you follow this process to delete Ruritletharat.info ads let us know how you managed by sending us your comments please. First of all, check the list of installed software on your machine and delete all unknown and recently installed software. If you see an unknown application with incorrect spelling or varying capital letters, it have most likely been installed by malicious software and you should clean it off first with malicious software removal utility such as Zemana Anti-malware. Scroll through the all list, and uninstall dubious and unknown software. To quickly find the latest installed programs, we recommend sort apps by date. The Mozilla Firefox reset will get rid of redirects to intrusive Ruritletharat.info web site, modified preferences, extensions and security settings. It will save your personal information like saved passwords, bookmarks, auto-fill data and open tabs. Click the “Refresh Firefox” button at the top right of the Troubleshooting Information page. Select “Refresh Firefox” in the confirmation dialog box. The Mozilla Firefox will begin a task to fix your problems that caused by the Ruritletharat.info adware. When, it’s finished, click the “Finish” button. If you find that Internet Explorer internet browser settings such as homepage, search provider and new tab had been changed by adware that causes tons of undesired Ruritletharat.info pop-ups, then you may return your settings, via the reset web-browser procedure. First, start the Internet Explorer, then click ‘gear’ icon . It will open the Tools drop-down menu on the right part of the internet browser, then click the “Internet Options” as shown in the following example. In the “Internet Options” screen, select the “Advanced” tab, then click the “Reset” button. The Microsoft Internet Explorer will show the “Reset Internet Explorer settings” prompt. Further, press the “Delete personal settings” check box to select it. Next, press the “Reset” button as displayed on the image below. When the procedure is finished, press “Close” button. Close the Internet Explorer and reboot your computer for the changes to take effect. This step will help you to restore your browser’s new tab page, search engine and homepage to default state. Another method to delete Ruritletharat.info advertisements from Chrome is Reset Google Chrome settings. 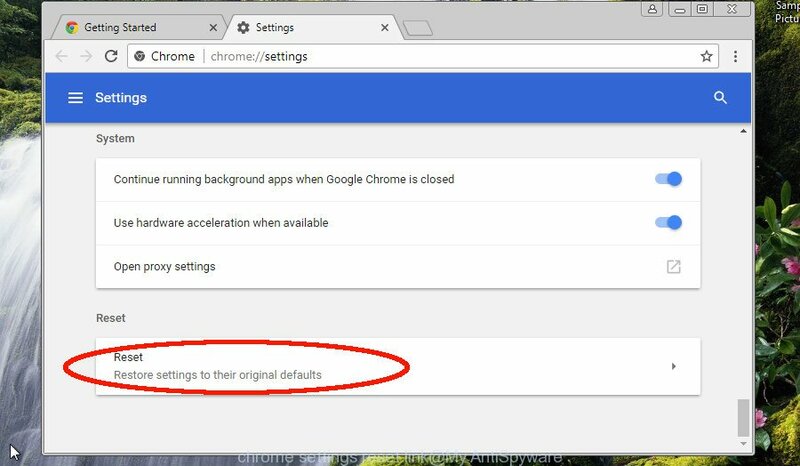 This will disable malicious addons and reset Google Chrome settings to default values. However, your saved bookmarks and passwords will not be lost. This will not affect your history, passwords, bookmarks, and other saved data. Carefully browse through the list of installed addons. If the list has the add-on labeled with “Installed by enterprise policy” or “Installed by your administrator”, then complete the following tutorial: Remove Google Chrome extensions installed by enterprise policy otherwise, just go to the step below. Many antivirus companies have made software that allow detect adware and thereby get rid of Ruritletharat.info from the Edge, Chrome, IE and Firefox internet browsers. Below is a a few of the free applications you may want to run. Your personal computer may have a ton of PUPs, ad-supported software and hijackers installed at the same time, so we suggest, if any unwanted or harmful program returns after restarting the computer, then launch your system into Safe Mode and use the anti-malware utility again. Zemana AntiMalware (ZAM) is an ultra light weight tool to remove Ruritletharat.info pop up advertisements from the Firefox, Microsoft Internet Explorer, Microsoft Edge and Google Chrome. It also deletes malicious software and ad supported software from your PC. It improves your system’s performance by removing potentially unwanted applications. When downloading is complete, please close all applications and open windows on your personal computer. Next, launch a file called Zemana.AntiMalware.Setup. This will open the “Setup wizard” of Zemana Anti Malware onto your PC. Follow the prompts and don’t make any changes to default settings. Further, click the “Scan” button . Zemana program will scan through the whole system for the adware responsible for redirects to the Ruritletharat.info. When that process is finished, Zemana Free will prepare a list of undesired applications adware. When you are ready, press the “Next” button. The tool will remove ad supported software that causes internet browsers to display intrusive Ruritletharat.info advertisements and add items to the Quarantine. Once disinfection is finished, you may be prompted to reboot the computer. Hitman Pro is a portable application that requires no hard setup to identify and remove ad supported software which cause unwanted Ruritletharat.info advertisements to appear. The program itself is small in size (only a few Mb). Hitman Pro does not need any drivers and special dlls. It’s probably easier to use than any alternative malicious software removal utilities you have ever tried. HitmanPro works on 64 and 32-bit versions of Windows 10, 8, 7 and XP. It proves that removal tool can be just as useful as the widely known antivirus programs. Download and use HitmanPro on your PC system. Once started, click “Next” button for checking your personal computer for the ad-supported software that responsible for browser redirect to the undesired Ruritletharat.info web-site. A scan can take anywhere from 10 to 30 minutes, depending on the number of files on your computer and the speed of your computer. 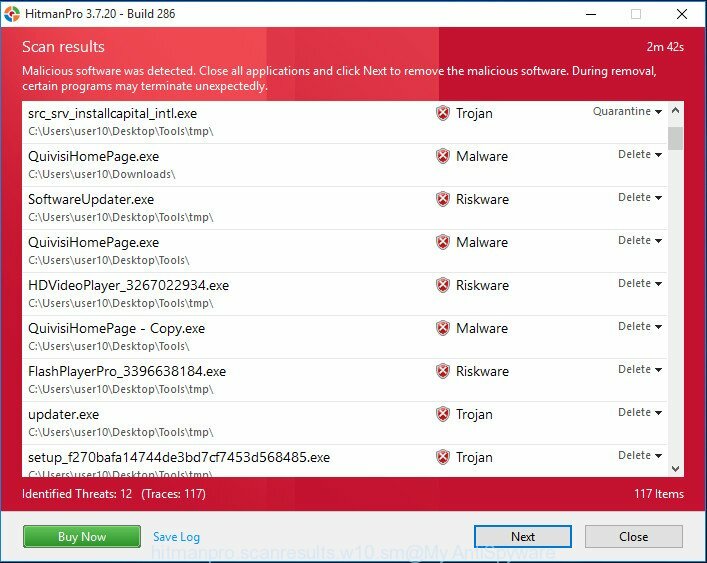 While the HitmanPro utility is scanning, you can see number of objects it has identified as being affected by malicious software..
Once the scan is finished, HitmanPro will create a list of unwanted programs adware. Once you’ve selected what you want to get rid of from your PC system press Next button. It will show a prompt, click the “Activate free license” button to start the free 30 days trial to get rid of all malware found. We advise to install an ad blocking program which can block Ruritletharat.info and other unwanted web-pages. The ad-blocking tool such as AdGuard is a program that basically removes advertising from the Internet and blocks access to malicious web sites. Moreover, security experts says that using ad-blocker programs is necessary to stay safe when surfing the Web. Visit the following page to download the latest version of AdGuard for MS Windows. Save it on your MS Windows desktop or in any other place. After the setup is done, press “Skip” to close the installation program and use the default settings, or press “Get Started” to see an quick tutorial which will assist you get to know AdGuard better. In most cases, the default settings are enough and you do not need to change anything. Each time, when you start your computer, AdGuard will run automatically and stop popup ads, block Ruritletharat.info, as well as other malicious or misleading webpages. For an overview of all the features of the application, or to change its settings you can simply double-click on the icon called AdGuard, that is located on your desktop. Now your personal computer should be free of the adware related to Ruritletharat.info pop up ads. We suggest that you keep Zemana Free (to periodically scan your PC system for new adwares and other malware) and AdGuard (to help you stop annoying popups and harmful web sites). Moreover, to prevent any adware, please stay clear of unknown and third party apps, make sure that your antivirus program, turn on the option to scan for potentially unwanted software. If you need more help with Ruritletharat.info popups related issues, go to here.